All of my historical novels set in Wales/Cymru published by Eres Books, will be on sale at about a 65% discount through the month of March, beginning tomorrow until Monday, April 4th. This sale includes ALL my books currently listed on Amazon, Kobo, Barnes & Noble, All Romance eBooks, and Smashwords during the same time period, approximately $1.35 each! Prepare your library for summer reading at these great discounts. See also my contemporary romance novels – also on sale. For details see: Everwriting on WordPress. Wicked Women, How We Love Them! What is a story without a wicked woman? Any villain adds depth and conflict to a tale but those evil women knock us for six. We love them. And those of us who create them, have so much fun doing so. Three of my wicked girls are among my favorite characters. We all know the behaviors that are considered evil. Exploring the motivations for wickedness requires a bit of soul-searching and an admission that, as writers, we must delve into the dark within our own conscientiousness to create these monsters. Disney is renown for his wicked women, Maleficent is the most enduring as well as the one who has courted the most recent attention. Though she is also the wicked stepmother as was Cinderella’s nemesis, Maleficent captures our deepest longings for approval and everlasting beauty at the cost of perpetual wretched jealousy. Until recently, this wicked creature was my desktop wallpaper and I give full credit to the artists at Disney Studios (decades before Pixar) for creating such a compelling, iconic image of female malevolence. How can we resist such power and determination? Morgan Cwmdu comes to the fore at full strength to win Maides’s loyalty. Of all my characters, Morgan Cwmdu, of Pendyffryn: The Conquerors, comes closest to epitomizing the depths and heights of what wickedness can be achieved given full reign. She is a villainous vixen whose obsession with destroying Caryl Gernant, as well as the lives of everyone close to her, costs Morgan the one goal she strives to achieve. Caryl is both the obstacle to that goal and Morgan’s determination to rid the world of her is the cause of Morgan’s failure to gain her cherished prize. So enthralling is Morgan Cwmdu’s efforts, she appears in some form in all five of the books of The Conquerors and returns to do her worst in the forthcoming The Inheritors series. Another of my wicked girls is Alys Talgarth, Heledd Banawg’s nemesis in Traitor’s Daughter. Alys has self-esteem crises. Her jealousy of her cousin plays well with her own father’s fear that Heledd will discover the truth about her father’s death. These combine to encourage Alys’s petulant and cunning tricks meant to destroy her cousin. Alys will appear again in Vengeance’s Son, as determined as ever to ruin any chance of happiness that Heledd has grasped since their last meeting. Heledd has two malevolent females to battle. The third is Llinos Cenfyn, also a character in Traitor’s Daughter. Where Alys departs, Llinos enters. She fears that her brother, Huw Brodawel, has plans to disinherit her sons in favor of Garmon, the commander of Huw’s war band. Tormenting Garmon is her favorite pastime but encouraging her sons to pester Heledd adds considerable enjoyment to her annual sojourn to the well-ordered and peaceful enclave between the Taf and the Tawel rivers, beyond the Tywi. Llinos is an expert at “innocent” comment, sharp and snide beneath the thin veneer of civility. Creating wicked women, as I wrote at the outset, requires an intimate knowledge of such women and a personal understanding of their motivations. I confess I am as guilty as any writer in finding wickedness both engaging and delightful to explore. Creeping into the depths of evil to discover a method to destroy it is a worthy effort. Although we are pretending to slay the worst among us, the discoveries along the path to that end often help conquer the realities that overwhelm us in the real world. This is the reason we gravitate toward scary movies and horror stories. We can confront the demons we know are real from a safe distance. And there is liberation in expressing our darkest thoughts and desires through fiction and make-believe. Writers can explore depravity and devilish conduct, delve into our own psyches, acknowledge that we are capable of great harm, take secret revenge on our own nemeses, face our foes and construct happy solutions—with words. On September 16, 1400 (Medi 16), leaders from all areas of Cymru came together in Glyndyfrdwy to ask Owain Glyndwr to become Tywysog Cymru (Prince of Wales), as well as to lead them in a war of independence against the English king, Henry IV (Hotspur of Shakespeare’s history play). This was more than 100 years since Edward I of England declared his own son prince. Although there were Welsh princes who led their country against the descendants of the Norman invader, William, Edward’s ambition and excesses of violence and cruelty exceeded any English ruler before him. Thereafter, no true prince of Wales was crowned until Owain. He followed in the legacy of Llewelyn II, Ein Llyw Olaf (Our Last Leader) who was ambushed and beheaded at Cilmeri, near Llanymddyfri, Powys, in December 1282, giving Edward the opportunity to replace the Welsh ‘aristocracy’ with his son. Llewelyn’s daughter, then two years old, was imprisoner in a nunnery and his brother, Dafydd, was tortured, drawn and quartered (ripped apart by four horses). Owain Glyndwr was born into a prominent family (pendefigion) about sixty years later, c1354. He had made a place for himself in Welsh history in earlier years but was considered elderly in 1400, when he was asked to lead the country against the English. For years, he led the Cymry against the English strongholds, harassing the towns on the eastern border and destroying the Norman castle in Caerfyrddin in 1404. The remains of the castle form part of the foundation of the County Hall of Dyfed, now split into the counties of Sir Gâr, Ceredigion and Penfro. A few years earlier, Charles VI of France had sent an emissary on Glyndwr’s behalf to Robert, the king of Scotland. Dafydd ap Ieuan was captured and imprisoned by the English but Glyndwr continued to succeed without any external support. In Mai 1404, in the presence of representatives from France, Spain and Scotland, Owain Glyndwr was crowned Tywysog Cymru with the blessing of Pope Avignon. In 1409, Henry V ruled England. The war for independence continued. Glyndwr’s wife, Marged, two daughters and three grand-daughters were captured and taken to London as prisoners. 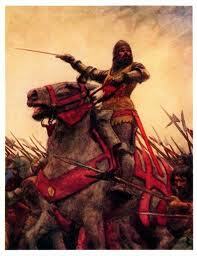 Glyndwr led his final effort against English tyranny in 1410. Several of his supporters were taken as prisoners and he was labeled a traitor. By 1412, Glyndwr was a hunted man, as were his friends and supporters, ‘Gwerin Owain,’ but his son, Maredudd ap Owain continued the rebellion against English tyranny until 1421 with the support of Scotland and the districts of Arfon and Meirion. Efforts in Cymru’s cause continued in Europe as late as 1415 with France declaring the Cymru was an independent nation although the English insisted Cymru was a part of England. After 1415, no mention of any kind was made of Owain Glyndwr. He simply and quietly disappeared from the pages of history. Some say he retired from the battle to live in his daughter’s home in the border Marshes of Powys. Although there was a price on his head, no one betray him to the English. No mention has ever been made of his death and he has no burial place that anyone has found. Some say Owain Glyndwr lives still. Certainly, the spirit of Glyndwr endures to this day. The Cymry have never succumbed to the temptation to become English nor even, ‘British Welsh.’ Patriots of freedom for Cymru fly Glyndwr’s banner along with the Draig Goch (Red Dragon). And no true Tywysog Cymru has been crowned since Glyndwr’s disappearance. If you’ve read The Englishman Who Went Up a Hill and Came Down a Mountain, you might have had great laughs from the nicknames of the characters. This tradition is practiced in Cymru today as well. A couple in Caerfyrddin, where I lived, were called John Nellie and his wife, Nellie John. This form of address is the way the language (Cymraeg) expresses the possessive. In English, we say Judy’s hat. In Cymraeg, we say het Judy. The object of the possessive case is dominant, the more important thing. In the case of John Nellie, John is the possessed person by the possessor, his wife, Nellie. With Nellie John, Nellie is the person possessed by John, her husband. Equality to perfection. This married pair belonged to one another and everyone knew them in this charming way. One of our acquaintances was known as Mattie the Gas. She worked for the Gas Board. Another amusing appellation is Tim Court. Tim is often taken to Small Claims Court when he neglects to pay the tradespeople’s bills. Many people earn their nicknames through their actions, as in Tim’s case. Others earn a more affectionate name through their work as in Mattie, above. One of my friends was always known as Siân Toronto, earned for her great efforts to support and promote Cerddoriaeth Werin Cymru (Welsh Folk Music) and the undeniable fact that she came from Canada. I employed the above custom to name Garmon Dolwyddlan in Traitor’s Daughter as he claimed to come from that estate and has no father he knows. In the same novel, the chieftain’s poet is called Talog Bardd – his birthplace and his profession. Like the Scandinavians, Celts named their children after the father. In Cymru, this is the father’s first name. There is no legal requirement for a child to have a family name. Some people have given their children the names of saints as a second name, such as Padarn, Dewi, Teilo. Or the river running through the region of their birth, as Twyi, Ystwyth, Dulais, Tawe, Taf. Not often now, but we used to hear the people of Cymru called Taffy, with all manner of disreputable characteristics attached. The river running through Caerdydd, Cymru’s capital city, is the Taff. As we know, Canada means “this place” in the native Algonkian language of that country. And Avon means “river” in Cymraeg. Therefore, Stratford-on-Avon is “Stratford on River” and when you hear River Avon, think Afon Afon (River River). Still today, we hear the term Welsh used to mean “renege or default on a debt.” Needless to say, the Cymry take offense to the use of this term. Our names are kindred to ourselves and our identities, so much so that to destroy our good name can be the end of the good we think of ourselves. This is one of the most moving clips which exemplifies that connection between our names and who we truly are: The Crucible: “Because it is my name.” The actor playing the role of John Proctor is Osian Rhys. It is no small thing to put your name to a book or story or letter or confession. 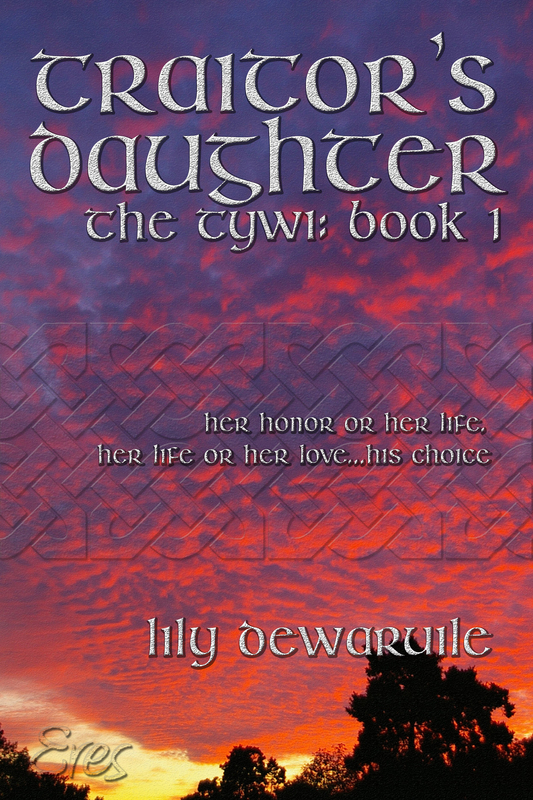 Therefore, I give you my name/s: I write medieval Welsh romance as Lily Dewaruile, which is purported to be my family name from the late 10th Century but I am Leigh Verrill-Rhys, also a writer.